Hello lovelies – with Mother’s Day happening in just two days, i’m pretty sure you’ve dropped your wishlists and wants hints to your families and i’m sure you’ve sorted out gifts for your own Moms and Mothers in Laws. But what if i told you i had another beautiful spoil for one of you to keep or giveaway to someone who deserves one? I’m sure you all know Janine Binneman Jewellery – Janine is a good friend of mine and a very on the ball jeweller, tapping into trends, making her own signatures and just creating, creating, creating. She has two arms to her business – her off-the-peg pieces and her fine jewellery designs – all handmade in her studio. I pop in there regularly and have to practically sit on my hands not to dive into the gem stones and pendants and pretty stuff they have there! 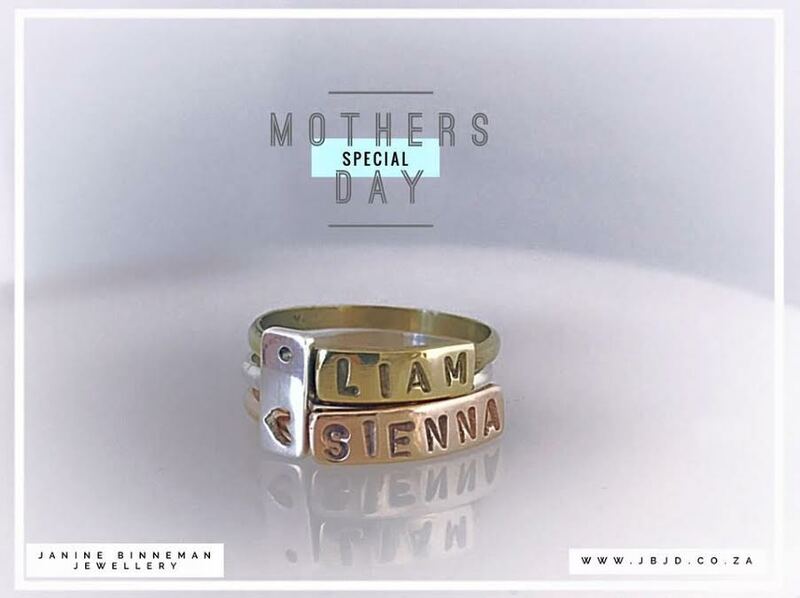 So…in honour of the Moms out there – i have a beautiful gift of two original name rings and a heart connector to give away. Oliver Sophie Christopher and Leah …. would love their names on a ring!! Anria Marni My precious daughters!